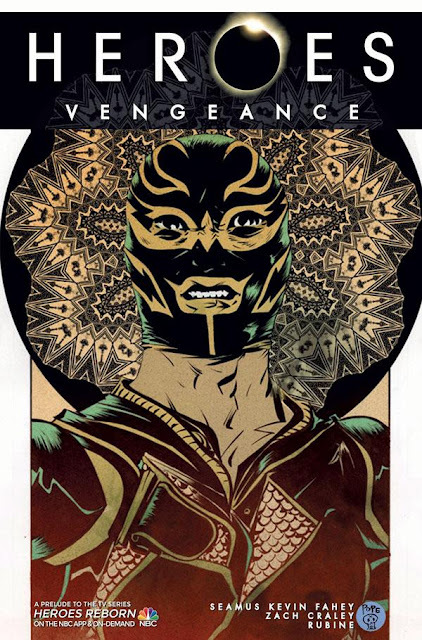 Titan Comics: HEROES VENGEANCE #5 Review | Warped Factor - Words in the Key of Geek. Never meet your heroes, says Tony. Heroes Vengeance has been at various points a highly emotionally-charged and well-plotted story of how the men in the Gutierrez family interpret the spirit of Vengeance – El Vegador – as a symbol not of actual vengeance but of popular hope, either as a masked wrestler, or as an EVO vigilante, fighting back against human traffickers and the corrupt cops on whom they rely to ply their trade. Writers Seamus Kevin Fahey and Zach Craley have developed a believable and richly textured backstory for Oscar Gutierrez, brother of Carlos from the TV version of Heroes Reborn. Both brothers have their grandfather to look up to and both of them have in their own way espoused a form of personal bravery – Carlos by going to war as a soldier, Oscar by staying at home in the old neighbourhood and living a double life, using the El Vengador mask and his EVO nature to deliver a bloody nose to the gangs that make his part of town dangerous for good people to live in. That said, issue #5, the final issue in the sequence, is a staggering and unexpected disappointment. The storyline of Oscar’s underground railway for EVO prisoners was really gathering steam, but this issue feels rushed and unfocused, trying to do too much all at once within too few pages and panels. 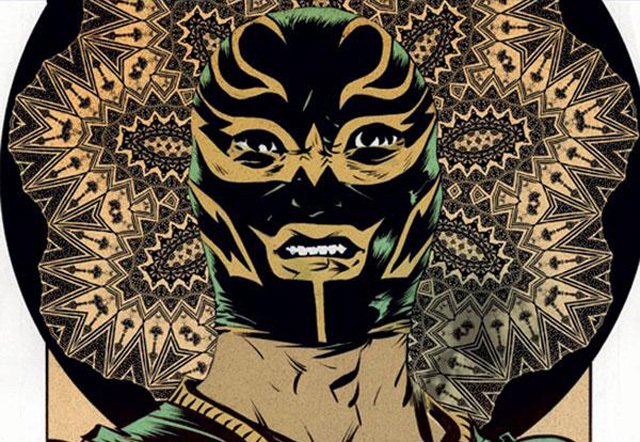 It tries to wrap up the underground railway story, provide a link back from Oscar to his grandfather, the original El Vengador, (who wrestled in the mask but was eventually unmasked in the ring, his career curtailed by the decision of the gangs that his fight should be fixed in favour of his opponent), provide a link forward from Oscar’s incarnation of El Vengador to that of Carlos, as portrayed on screen, and still deliver the tense action and fighting sequences that have become part of Heroes Vengeance’s stock in trade. It fails in a couple of these intentions, most crucially the wrapping up of the underground railway story and the passing on of the El Vengador persona to Oscar. The second of these is actually the most critical, in that it robs the whole five-issue arc of its intended purpose as a kind of contextualising semi-origin story for the on-screen Hero. We gain quite a lot of texture about the history of Carlos’ family and its history of embodying El Vengador in these five issues, certainly, but the handover to the on-screen generation is bungled, so we don’t get the connection and we lose the potential point. In essence, all that’s come before is rendered only interesting in its own right, without providing that vital thread to Oscar’s taking up the mask. This issue gives us a thread, certainly, with Oscar discovering Carlos in the mask, but there’s no real wealth of context given to Carlos’ understanding of what his brother did that would lead him to necessarily take over the family heroing business. The explanation we get feels like it needs more connectivity between the brothers, more confidence between them to explain the continuing of Oscar’s mission by his younger brother. In terms of the underground railway thread, that too disappears somewhere in the action panels. We understand that the crooked cops and the gangs want the railway stopped, but then the story goes into hyperdrive, fast forwarding through some indeterminate amount of time with Oscar doing his best, making the difference he can, but fighting an apparently endless battle against the gangs and eventually getting caught and bleeding to death – again, the exact nature of that encounter is left frustratingly vague, as though all the texture of the man and his life has been sacrificed at the last minute in a quest to get from A-B, from Oscar as El Vengador to Oscar dead so that Carlos can take on the mantle. It feels like a classic case of a student writing an essay, waffling for half its length because he’s not sure he has enough to say, then realising he has to fit a whole third act into the last five hundred words. It’s an amateurism with which we’re unaccustomed in Titan Comics, which normally paces out its storylines with a far more professional skill than this. It's an issue made all the more frustrating because the fight scenes continue here and, of all the elements, they would have been the most productively cuttable. Granted, in a gritty superhero comic-book, you need some action, but there’s a prolonged car chase and fight sequence here which could have been productively shortened to give more scope to delivering a connection between the Gutierrez brothers, making the eventual discovery of a dead Oscar by Carlos a thing with significantly more impact and giving us a thread to believe Carlos would have taken up his brother’s fight. All this being said, Rubine, the artist who has rendered El Vengador into being with all his intensity and richness of texture intact continues to impress throughout this issue, giving us vivid images all the way through and working overtime towards the end to sell the progress of El Vengador as Oscar continues his fight against the gangs, and for the innocent people of his city. Believe us when we tell you that the artistic skills are very much in place to have delivered a cracking finale to this story. What’s missing, and where this issue falls down on those that have preceded it, is the narrative connectivity and the pacing from Fahey and Craley, which sadly leaves issue #5 of Heroes Vengeance, and ultimately the whole backstory of El Vengador, feeling unfinished and oddly empty.